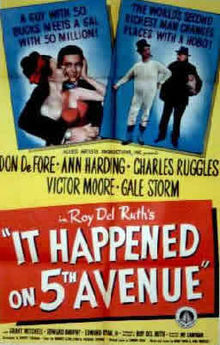 It’s funny, It Happened on 5th Avenue (1947) is one of my favorite Christmas movies, but you don’t even see a Christmas tree until the movie is nearly over. Still, I’ve added it to my annual holiday queue, because it has the warm spirit of the best holiday movies. The story begins with a drifter (Victor Moore) who decided long ago that, rather than work, he would enjoy the fruits of other men’s labors. This makes him a terrible person on paper, but a more agreeable guy in practice. He squats in lavish homes while the owners are away and he’s been happily spending his winters in the 5th avenue mansion of the second richest man in the world for the past three years. He runs into a veteran (Don DeFore) who has just been evicted, and they think they run into another drifter (Gale Storm), though she is actually the daughter of the man who owns the house. Everyone shacks up, which is more wholesome than it sounds. Then the veteran’s army buddies, their wives and children move in. Finally, the wealthy owner himself arrives and lives there incognito with his ex-wife who has flown in from Florida. As can be expected, this full house has its share of craziness, but it isn’t madcap. The humor is laid back. Sometimes it is sly and ironic. Often it is tender and sweet. It all works because the cast is so charming. Aloysius T. McKeever (Victor Moore) is the drifting squatter. He may wear another man’s clothes and pinch food from his pantry, but he’ll also make sure the furniture is dusted and that no one steals anything. Particularly the stuff he is borrowing. Jim Bullock (Don DeFore) is a high-spirited World War II vet who has just been evicted from his apartment. He is furious to realize he is staying the house of the man who ordered that eviction so he could destroy the building to clear space for a new development. Trudy O'Connor (Gale Storm) is the charming, lonely heiress. She is delighted to learn that so much is happening in her father’s home while everyone is away. It is just the thing she needs to lift her spirits. Michael J. 'Mike' O'Connor (Charles Ruggles) is the wealthy owner of the home, though he pretends to be an aimless drifter to humor his daughter. He bristles when Aloysius wears his lounging robe and gives him chores to do in his own home, but underneath his irritation, there always seems to be a small spark of amusement. Mary O'Connor (Ann Harding) is Mike’s ex-wife and Trudy’s mother. She also pretends to be a drifter, and she has a good time doing it. She’s the only one in the house with a sense of calm—like the eye of the storm. Mary is so dignified, she doesn't even look goofy in that party hat. Then there are the army buddies, their wives and children. I have to admit I mixed them up a lot. The only stand-out among them for me was a very young Alan Hale Jr., years before Gilligan’s Island. And this baby too. Isn’t he cute? This is a great flick, and since it’s not too Christmassy, you won’t feel weird if you watch it next week. So check it out! I'd been wanting to watch this movie for years and I finally got to watch it a few weeks ago and really liked it!! Great post!! Thank you so much for joining my blogathon! I just saw this for the very first time and really enjoyed it. Loved your write-up! 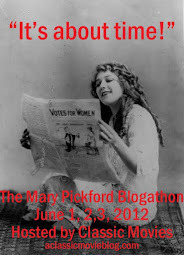 Sally--Thanks, I loved joining the blogathon. It's funny how this movie has grown so much in popularity over the past few years. It deserves the love! Laura--Thank you, I thought your write-up of 5th Ave was great! Loved the detail about Frank Capra. Christmas is easily complete without watching this film. It's pleasant, but not great. Does anyone know who the baby is? Did he work in movies later? That's a good question! I haven't seen the film for a while, so I'm drawing a blank on which character's baby it was.